This guide presents an overview of bookplates and the Yale Bookplate Collection. 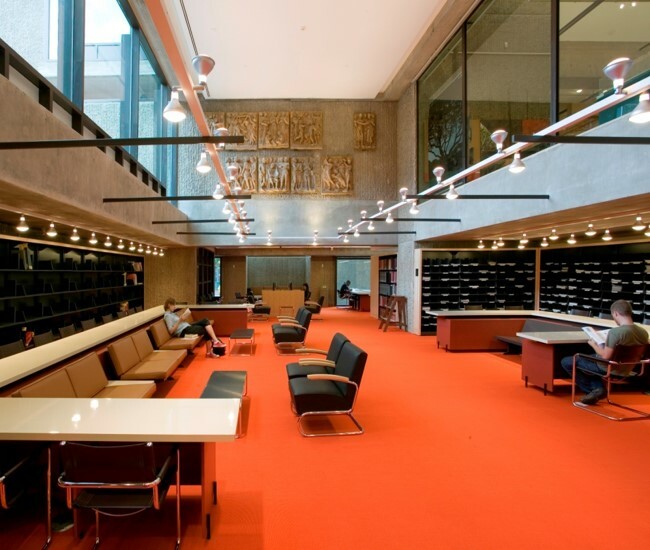 Yale's Arts Library, linking Rudolph Hall and the Loria Center at 180 and 190 York Street, serves as the primary collection for the study of art, architecture, and drama at Yale. The Arts Library contains approximately 150,000 onsite volumes including important reference works, monographs, exhibition catalogs, and print periodicals, as well as digital resources, including online periodicals, article indexes, and databases. Arts Library Special Collections features artists' books and volumes on the book arts, fine printing, typography, and illustration, as well as archival materials and thesis projects from the Schools of Art, Architecture, and Drama. An additional 300,000+ volumes are stored in the offsite Library Shelving Facility for quick delivery to any Yale Library via Eli Express. [Bookplate of Yale University Library] by Wm. F. Hopson, 1901, 10.9 x 7.6 cm. Pearson-Lowenhaupt Collection of English and American Bookplates (BKP 30), Robert B. Haas Family Arts Library, Yale University. 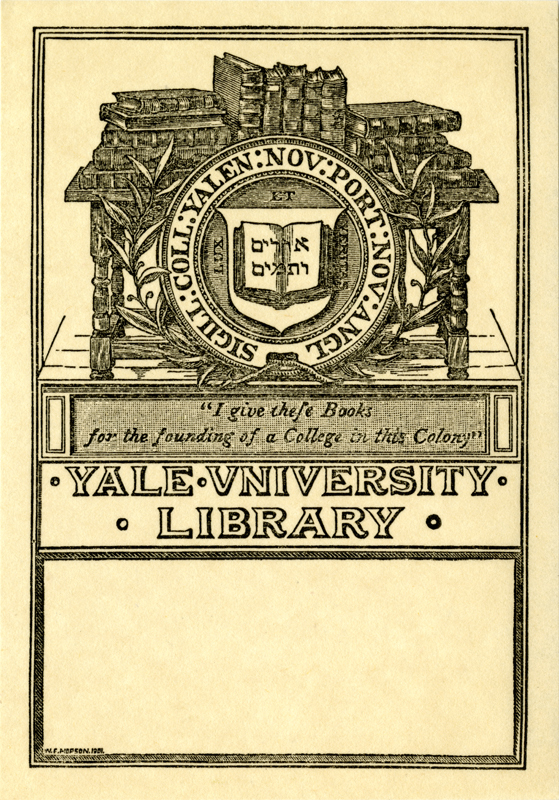 William Fowler Hopson’s 1901 bookplate in commemoration of Yale’s bicentennial cleverly uses the classic “book-pile” motif to reference the gifts of books that marked the founding of the college in 1701. This guide presents an overview of bookplates and the Yale Bookplate Collection. 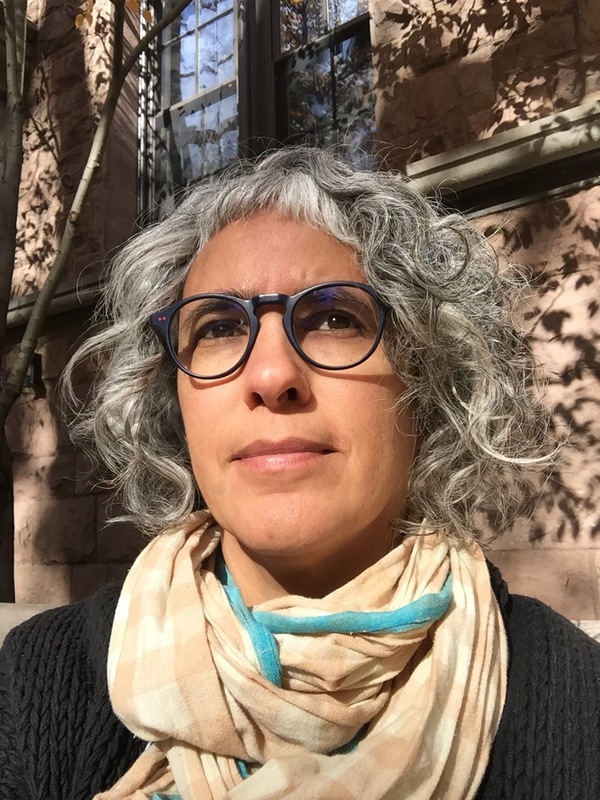 In addition, it offers different search strategies for identifying bookplate materials and suggests several themes by which to explore these collections. It also lists library exhibitions that feature materials from the Yale Bookplate Collection. Bookplates, also known as ex-libris, are labels pasted inside the front covers of books to indicate ownership. The custom of affixing bookplates to books began in the mid-15th century. Though earlier manuscripts also bore marks of ownership, the proliferation of printed books in Europe created a need to distinguish among multiple copies of the same title. Particularly around the turn of the 20th century, bookplates were prized for their aesthetic value as miniature prints. With no intention of affixing them to books, individuals began to commission bookplates solely as a means to collect, organize, exhibit, and exchange them as works of art.